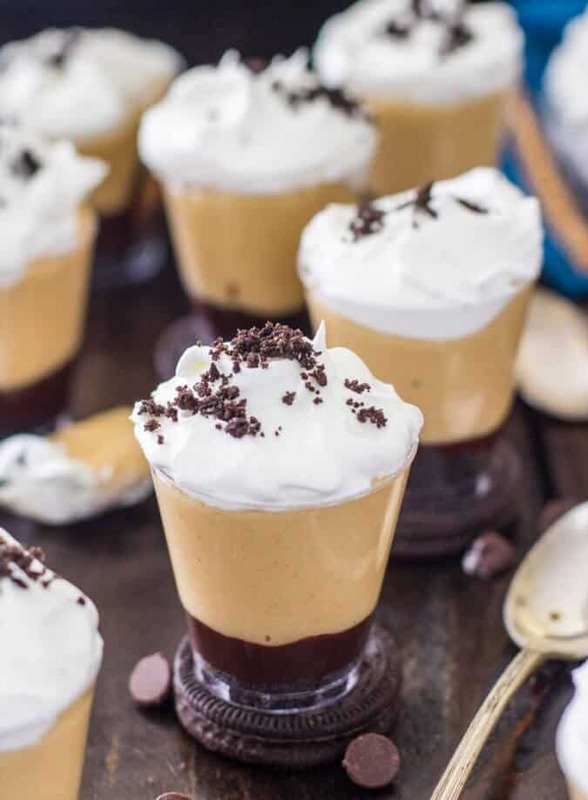 Easy, no-bake peanut butter pie dessert shooters! 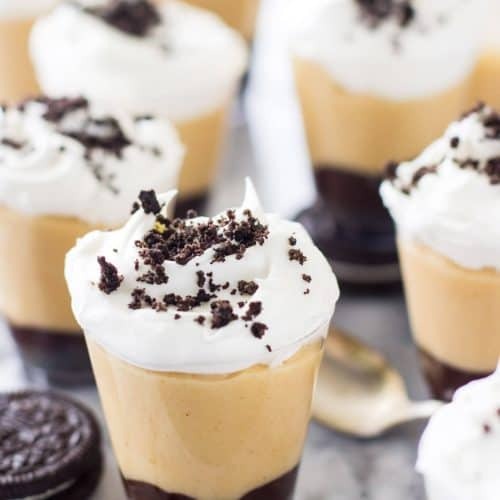 This peanut butter pie filling is layered over a silky chocolate ganache and an Oreo cookie crust and served individually in disposable shot glasses. 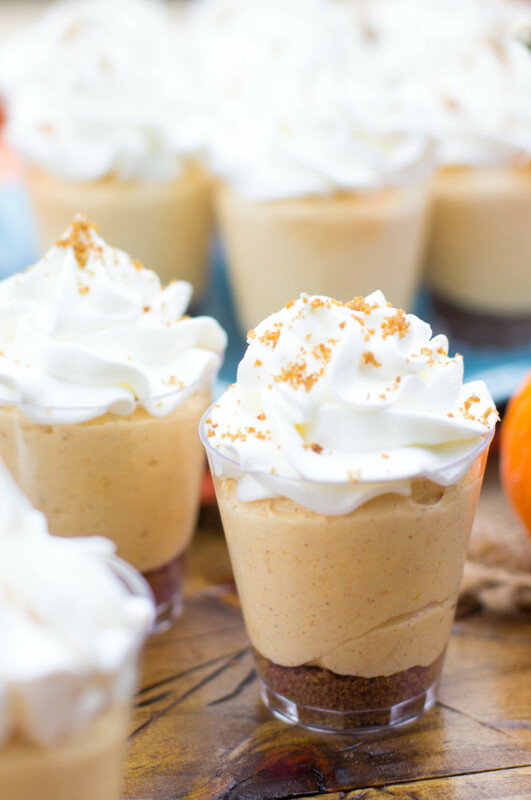 I love love love sharing shot glass desserts. 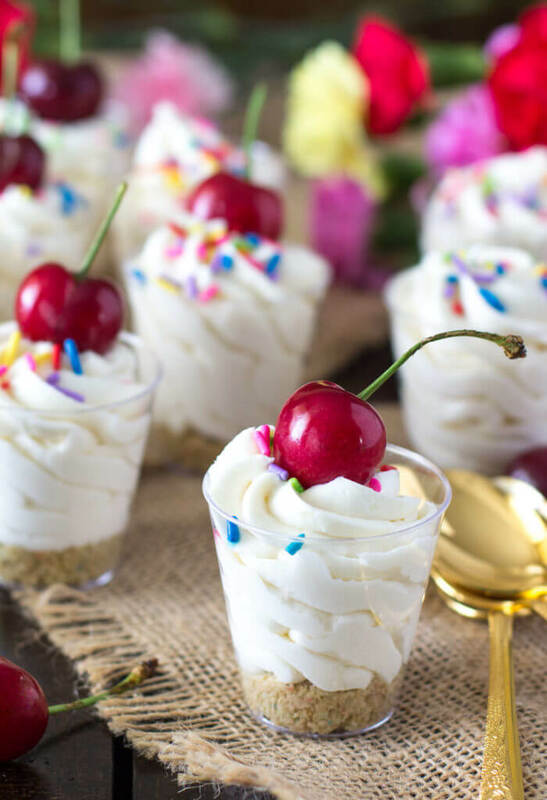 They are among the most popular desserts on my website, they’re adorable, and best of all, they are easy and fast to make. 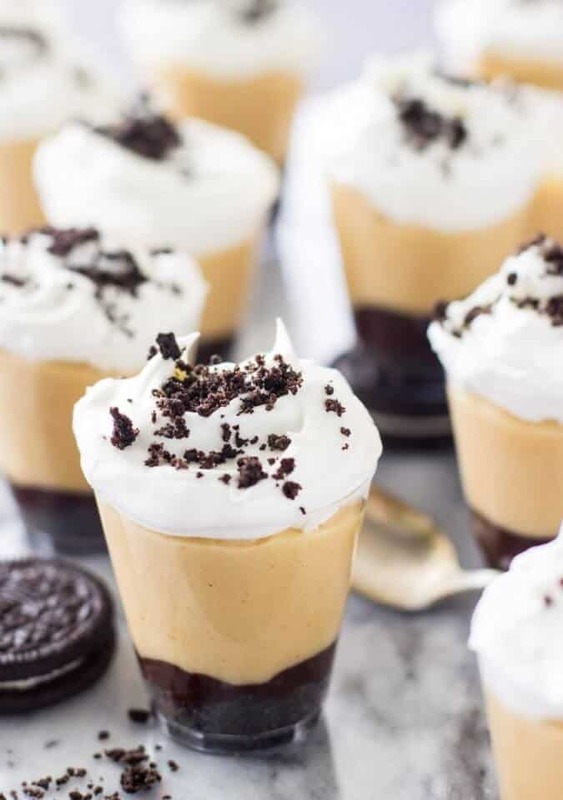 These peanut butter pie dessert shooters are actually the very first desert shooters I ever shared on Sugar Spun Run, and this recipe sparked an obsession (hence every other dessert shooter I have on this site). 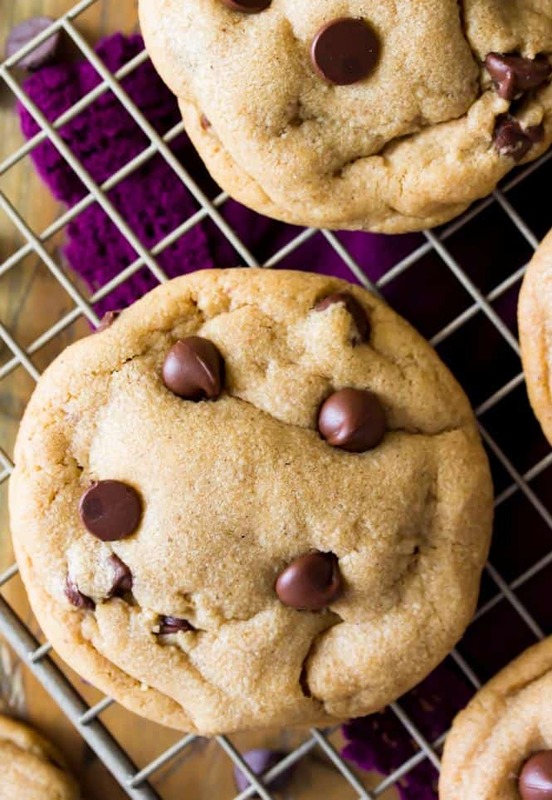 As they were one of my earliest recipes, the original photos did a severe injustice to their deliciousness, and I hardly ever (maybe never) shared them on Pinterest because I was so embarrassed by the pictures. They deserved better, and so here they are, re-shot for you. 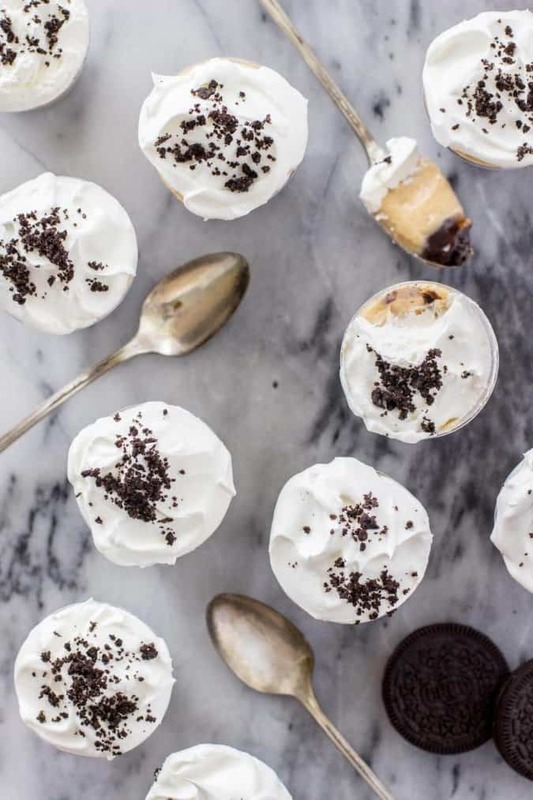 The filling starts with a cream cheese and peanut butter base, made light and fluffy with Cool Whip (though of course you can make your own whipped cream, instead!). 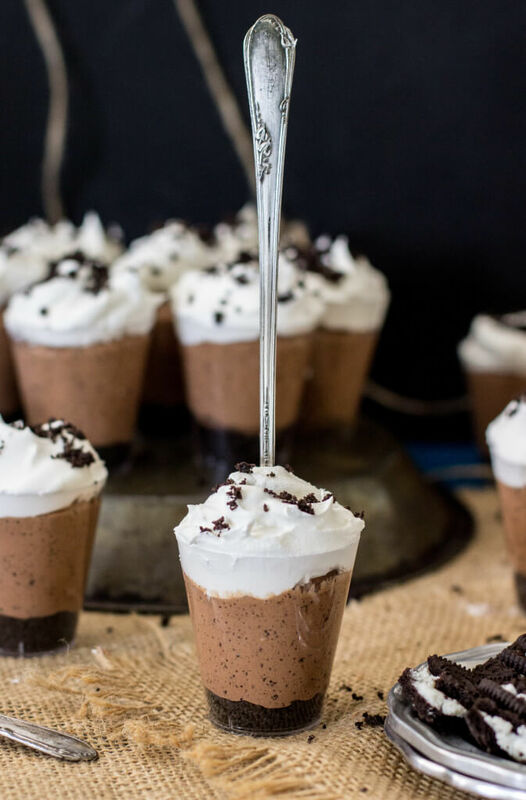 For the original recipe, I swirled each shot glass with a ribbon of hot fudge sauce that hugged the peanut butter filling, but here I made a silky chocolate ganache out of chocolate chips and heavy cream and layered that over the crust. You can do either — they taste delicious both ways! Another deviation from the original recipe is that I topped these with even more Cool Whip, mostly for aesthetic reasons. Optional, but it makes them look extra adorable. 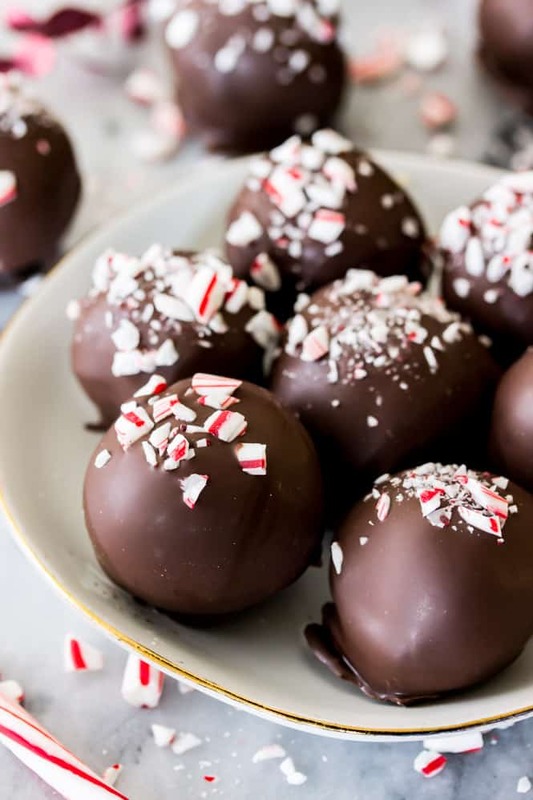 I brought these over to my grandmother’s this weekend for dessert and they were a huge hit. They’re fun to eat and perfectly portioned(though of course everyone wanted more than one, anyway). In food processor, pulverize 10 Oreo cookies to fine crumbs. Remove 2 Tbsp of cookie crumbs to sprinkle on top of shooters later, set aside. Add melted butter and process until well-combined. 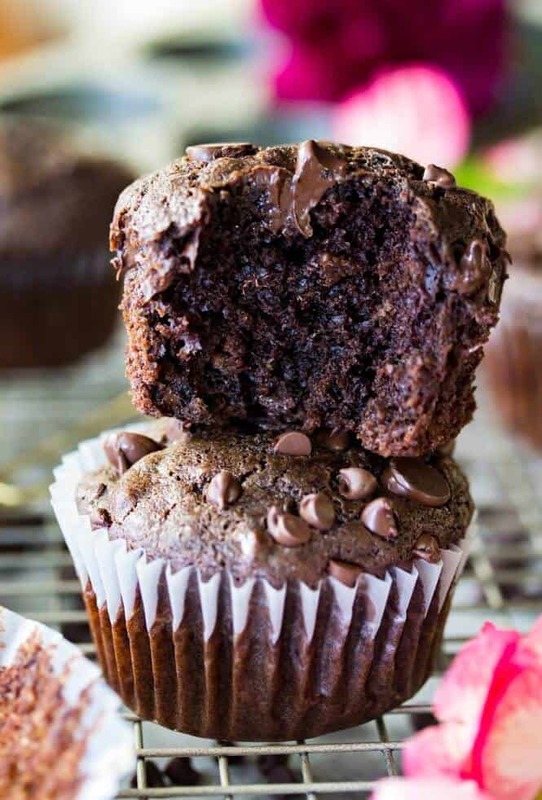 Press about 1 teaspoon of crumb-mixture into the bottom of each shot glass, and set aside. In stand-mixer fitted with a paddle attachment, cream together cream cheese and peanut butter. Gradually add 10x sugar, scraping down sides of the bowl as needed to ensure all ingredients are well-combined. With mixer on low-speed, stir in cool whip. Set filling aside. 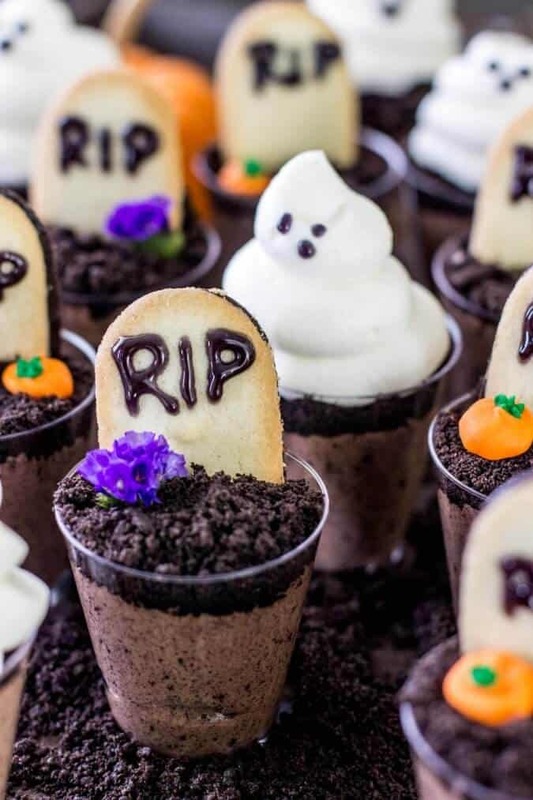 Return to your prepared shot glasses and spoon a thin layer (about 1-2 tablespoons) of chocolate sauce over the Oreo crusts. 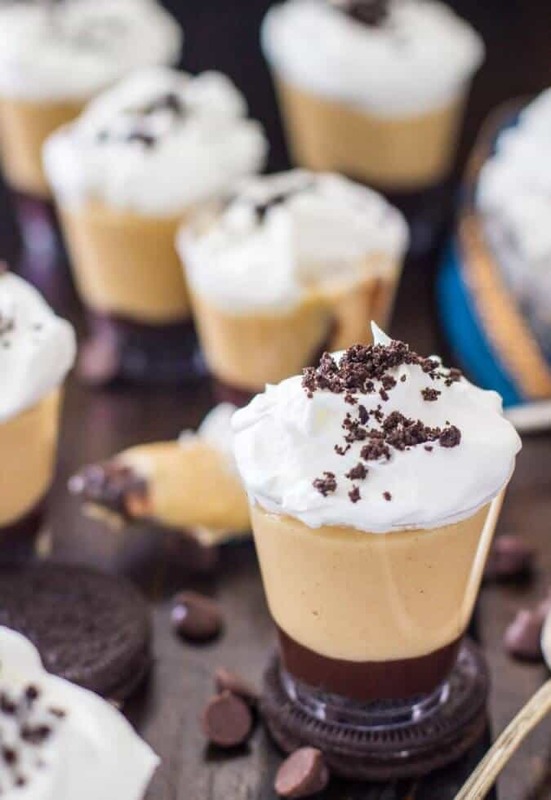 Pipe Peanut Butter Pie filling over chocolate, filling each shot glass just shy of the brim. Spoon remaining Cool Whip over tops, and sprinkle with cookie crumbs, if desired.